Forensic archeologists recently discovered copper cables buried ten feet below the surface of the ground in upstate New York. They stated that the discovery led them to assume that New York had a complete, if not functional, telephonic communication system more than a hundred years ago. Daleville Dan folded his local newspaper and read on to the story, continued on page two. The story continued with a statement from the Ohio geological society on their discovery, just a week after the New York discovery. 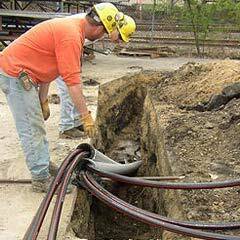 Geologists in Ohio dug to a depth of nearly twenty feet and discovered not only copper cabling, but wooden fragments believed to be telephone poles. They estimate Ohio may have established an electronic communication system up to two hundred years ago. "Dang, ain't that a hoot," Dan said to his friend, Bobby Joe. "Ah heck," Bobby Joe countered. "I'm sure Alabama must be more advanced than those folks." So, Daleville Dan pulled his shovel out of the shed, declared himself an amateur archeologist, and started digging right in his back yard. Dan dug for the next two weeks. He dug in the sweltering heat of the summer. He dug through torrential afternoon downpours and through crackling heat lightning. After two weeks of sweat and swelter, Dan had reached a depth of more than thirty feet. His efforts were not without peril. In his digging, he managed to cut through the city's gas main, his neighbor's cable and the drain field for his home's septic system. Other than that he found nothing. He was elated, and immediately called the local paper and the big television station in Montgomery to reveal his findings to the world. The next day, Daleville Dan stood proud in front of the massive hole he'd dug. Perplexed news reporters surrounded him with microphone booms extended and cameras rolling. One reporter started the questioning. "Daleville Dan," the reporter shouted above the agitated crowd. "You've declared yourself an amateur archeologist and spent the last two weeks digging this hole in your back yard. If you discovered nothing, what could this big announcement possibly be about?" Daleville Dan stood tall, and swept his eyes over the crowd, taking care to make eye contact with as many reporters as possible. He took a deep breath and waited for the crowd to fall silent. Finally, he said, "At more than thirty feet below the surface, I found nothing so I must assume that more than three hundred years ago, Alabama had already gone wireless!" You know, this is an amazing story... and that is a lot of satellites. 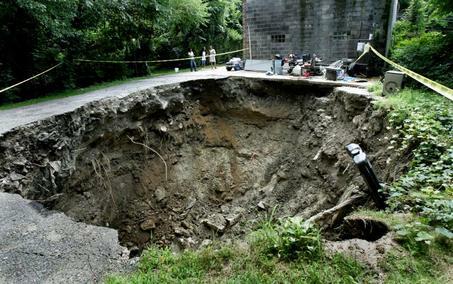 At first when I saw the hole in the ground, I thought it was a sink hole... ha ha ha. 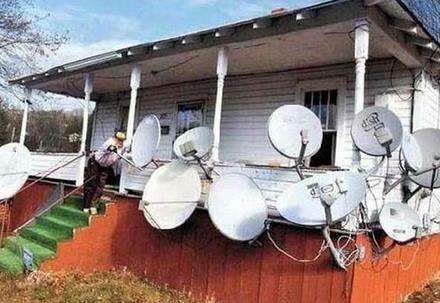 I guess they have gone wireless.